concerning the remarkable discovery of Paul Vaughan. 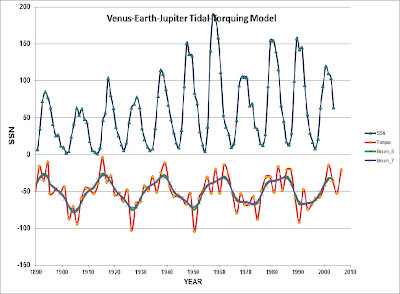 by the VEJ Tidal-Torquing Model [bottom graph]. rotation rate is lower than normal. equatorial convective layer is slowed-down. 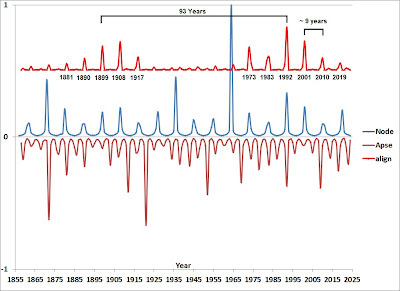 year period of the solar Hale (magnetic) cycle. me to use his graph here to support this post. 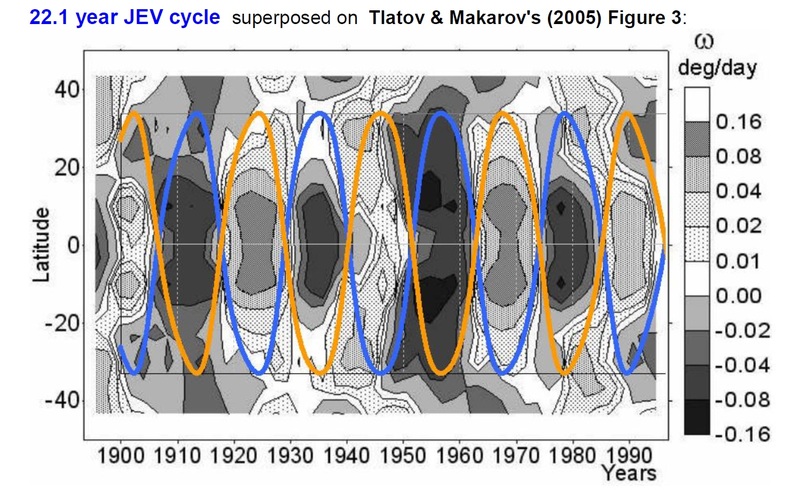 JEV cycle onto Tlatov & Makarov's (2005) Figure 3. 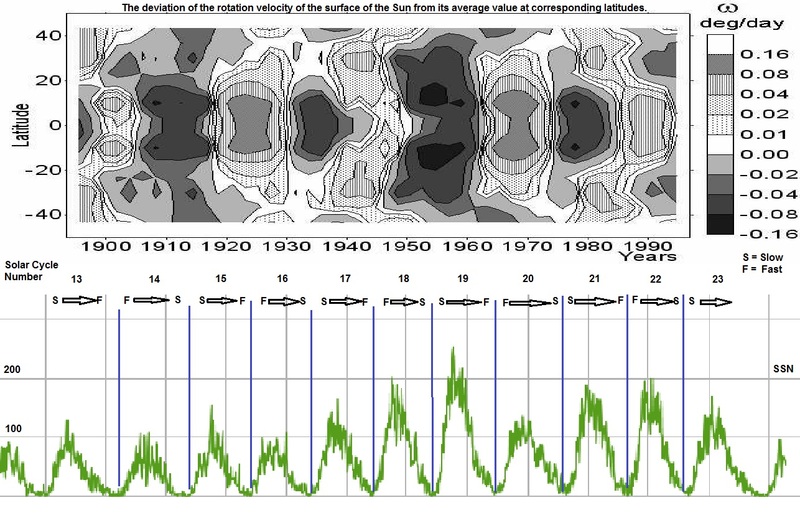 Role in Solar Activity, ASP Conference Series, Ed: K.
surface of the Sun over a period of 100 years. This is a remarkable result! 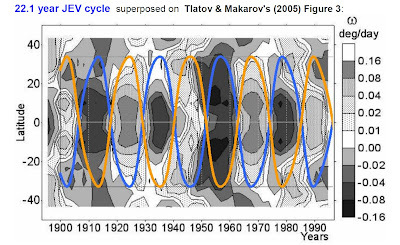 number for cycles 13 through 23.
published in the blog post of November 23rd 2012.
the previous solar cycle (measured in μrad s−1). 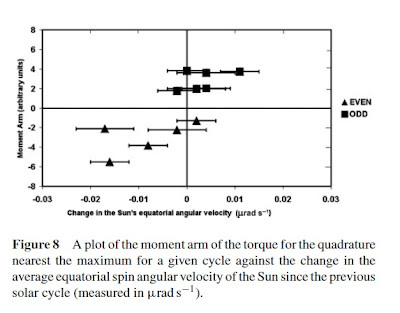 velocity (since the previous cycle) for cycles 13 to 23. IN THE SOUTHERN COLORADO PLATEAU, U.S.A. 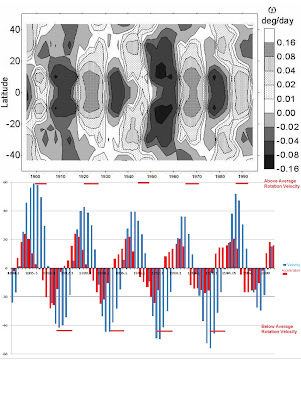 Given the controversial nature of the use of Bristle-cones as a proxy for temperature, I have quoted the section of this paper dealing with methods used in constructing the tree-ring chronology that reflects past temperature variability - see the Appendix at the end of this post. 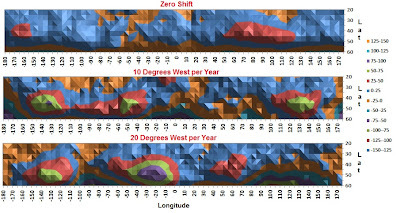 I would be the first to concede that while tree-ring widths in Bristle-cones are probably most sensitive to changes in temperature (because they grow near the tree-line), it is also likely that they are partially sensitive to changes in other climate factors such as precipitation levels, frequency of severe frosts and the amount of daily sunshine exposure etc. 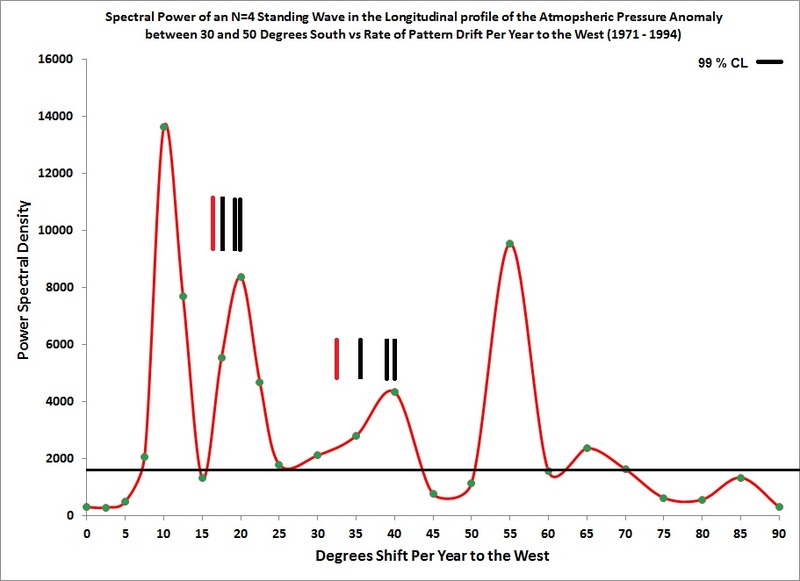 Hence, it is probably more accurate to say that the tree-ring widths of Bristle-cone pines are a good proxy for the general climate conditions that promote/retard the growth of these trees, chief of which is the local ambient temperature. 89 years, 104 years, ~ 150 years, 208 years, ~ 230 years, ~ 355 years and ~ 500 years. 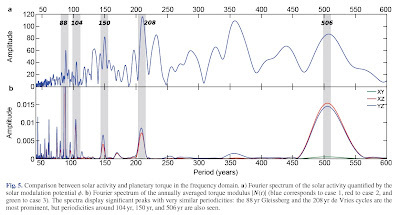 These spectra are based upon a time 9400 year time series of solar activity derived from observations of Be10 and C14. 89 years, 104 years, 150 years, 208 years, ~ 230 years, ~ 355 years and 506 years. 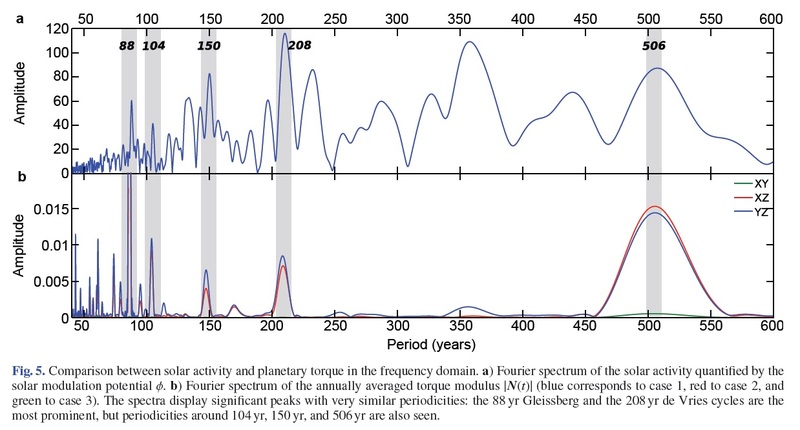 and the planetary torque shows all of these peaks, except those at ~230 & ~ 355 years. 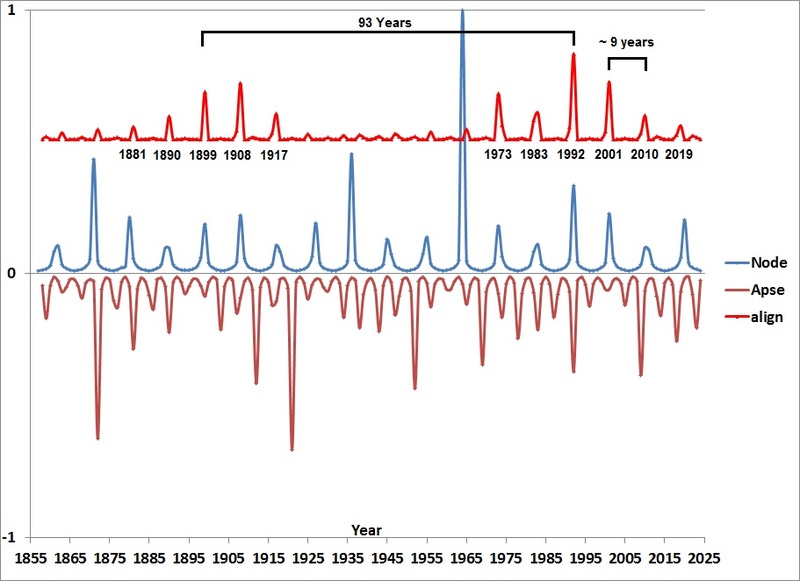 I believe that it is extremely unlikely that the spectral peaks for the North American temperatures are almost exactly the same as the spectral peaks for solar activity and planetary tidal torques acting upon the Sun. 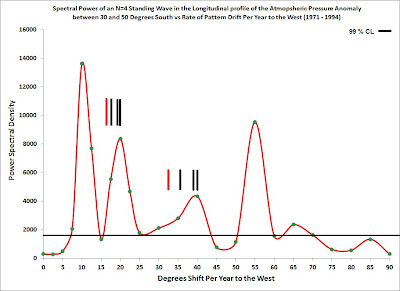 The question is how do the upper-tree-line Bristlecone Pine (P. aristata) in the San Francisco Peaks know about the level of solar activity on the Sun and the planetary torques being applied to the Sun? 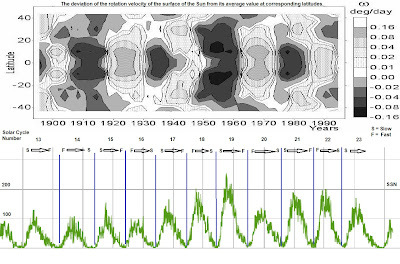 I claim that it indicates that the level of solar activity upon the Sun is modulated by planetary tidal-torquing acting upon the convective layer of the Sun and that it is these variations in the level of solar activity that have determined the mean temperatures of the North America continent over the last 2200 years. 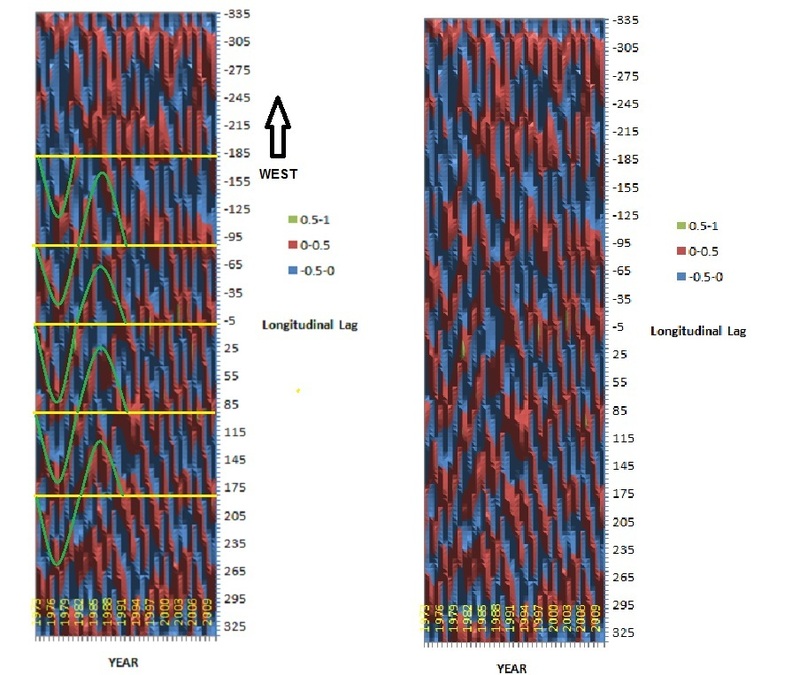 To build a tree-ring chronology that reflects past temperature variability, upper-tree-line Bristlecone Pine (P. aristata), whose ring-width variability is a function of temperature, were sampled at timberline in the San Francisco Peaks (∼3,536 m), where temperature is most limiting to growth (Figure 2). 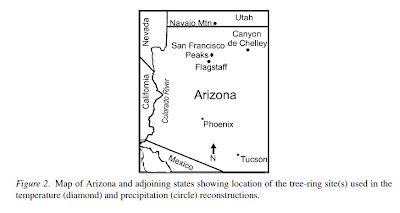 Increment core and sawed samples were collected from living and dead Bristlecone Pine on both Agassiz Peak and Humphreys Peak. Long chronologies were constructed by cross-dating the deadwood samples with the living tree specimens. Prior to AD 659 the chronology is composed entirely from deadwood material. The individual growth rings of each sample were measured to the nearest 0.01 mm. 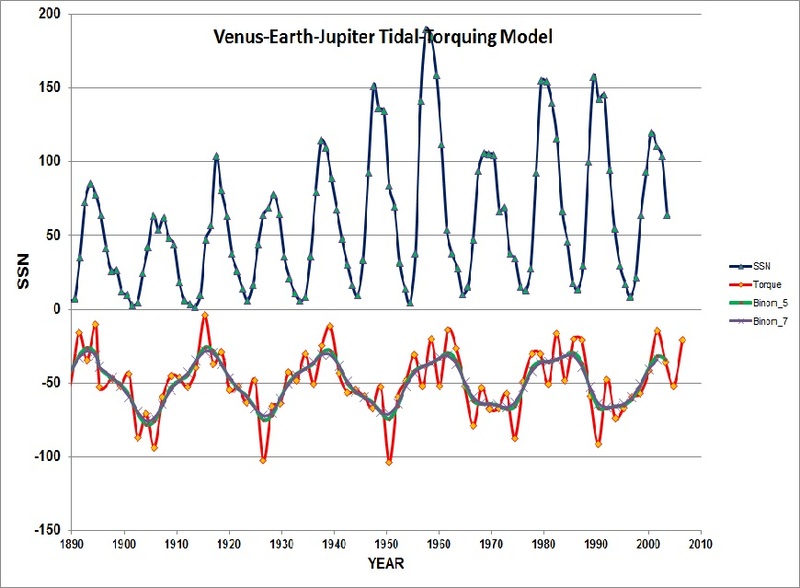 The measured series were converted to standardized tree-ring indices by fitting a modified negative exponential curve, a straight line, or a negatively sloped line to the series. This process removes the age/size related growth trend and transforms the ring-width measurement values into ring-width index values for each individual ring in each series (Fritts, 1976). Several statistics were calculated to gauge the reliability of the tree-ring series (Cook and Kairiukstis, 1990; Wigley et al., 1984) (Table I). Through conservative standardization techniques and the use of relatively long series, care was taken to preserve low-frequency information in the chronology (Cook et al., 1995). 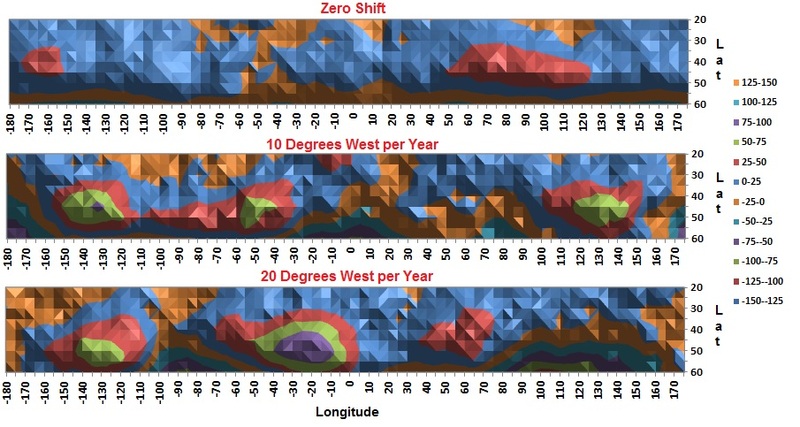 A regional curve standardization (RCS) approach (Briffa et al. 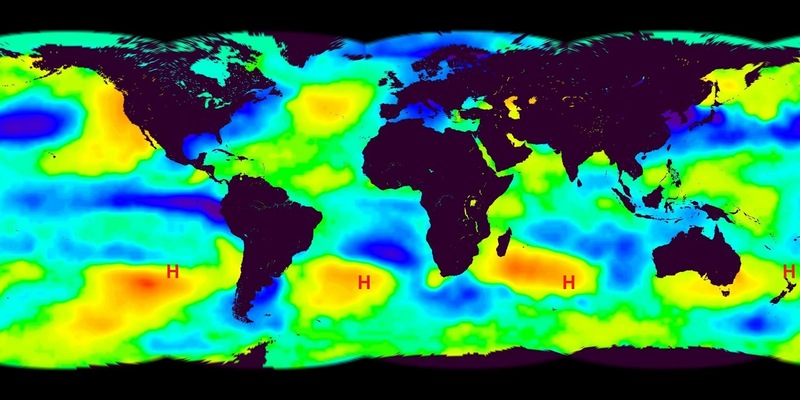 1992a), which has been used in some dendroclimatic studies to resolve multi-decadal to centennial trends, was considered but rejected. In general, RCS was devised for chronologies built from short series that use heavy detrending. The SFP chronology was built from relatively long segment lengths (Table I) and a conservative standardization process was employed. Additionally, we could not meet the necessary assumptions critical to successfully applying this technique: it was impossible to ascertain pith or near-pith dates from the deadwood material due to the irregular growth form of Bristlecone Pine, and we are not able to demonstrate that the age structure of the samples are evenly distributed. To create the mean site chronology, the annual standardized indices of tree growth were averaged. 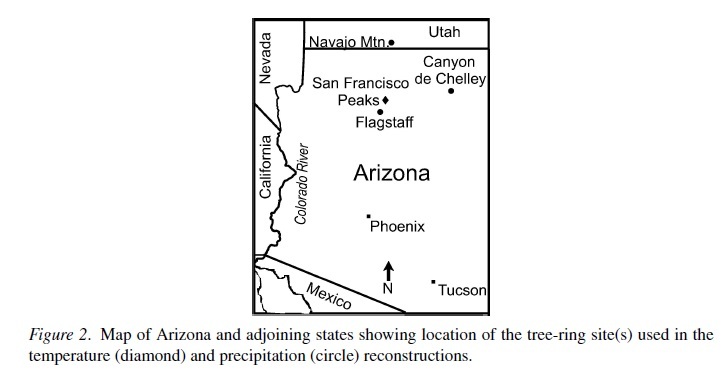 A single chronology was developed from samples collected at two sites on Humphreys Peak and one site on Agassiz Peak. The SFP chronology extends from 663 BC–AD 1997. In total, 234 series (130 trees) are used. The period before 266 BC is considered less reliable than the rest of the chronology as six or fewer series cover this interval. 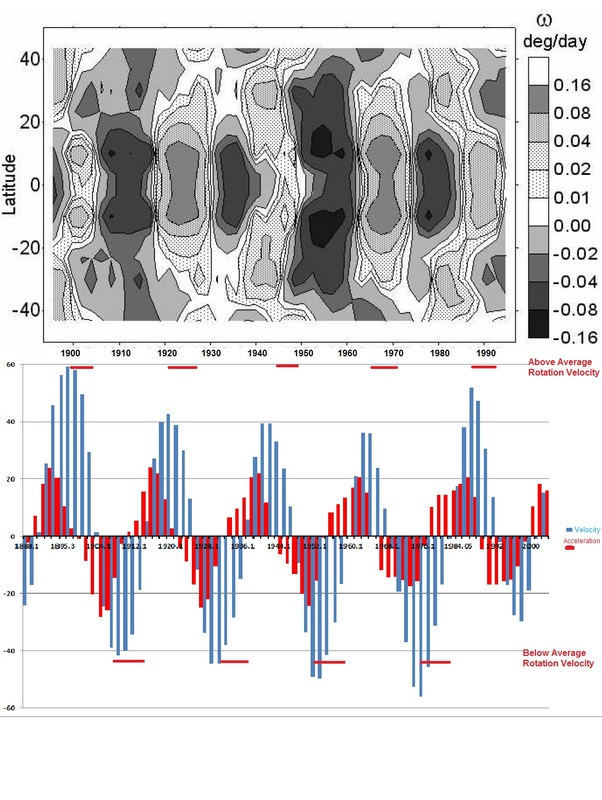 The climate data used in the temperature reconstruction calibration are from the Fort Valley Experimental Research Station, which is part of the United States Historical Climatology Network. 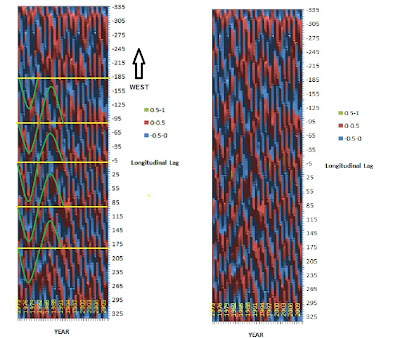 The station data, from an elevation of 2,239 m and approximately 4.5 km from the high elevation SFP tree-ring sites, span the period 1909–1994.